Saucer-Like, a highly artistic point-and-click adventure game developed by Fosfatina Ediciones and published by Tizona Interactive, loads to pleasing harp music and a peaceful screen with flowing clouds, waving grass, and a backdrop of rocky hills. The art style, a Jose Garnelo creation, is a minimalistic palette of earthy tones. Starting a new game cues a short animation in which the landscape, Kanji characters, and anime stylings are all reminiscent of Japan. The characters are drawn in a soft, rounded fashion, like those in a Miyazaki film [EN: For those of you in the nation’s capital who crave yet Japanese art, visit Yayoi Kusama’s Infinity Mirrors exhibit, featured at the Hirshhorn Museum and Sculpture Garden through May 14]. The cast come in sharp focus against the heavily textured backgrounds, which resemble pastels on coarse paper. Everything about the artwork is subtle, intentional, beautiful. As the opening animation ends, the music blends into an orchestral score. Its melody merges into a single track, weaving in and out different themes for locations or people. The score incorporates sounds from the environment in a way that is too intentional to dismiss. I cannot overstate the nuances of every inch of this title; Saucer-Like feels like a piece of art as you play. 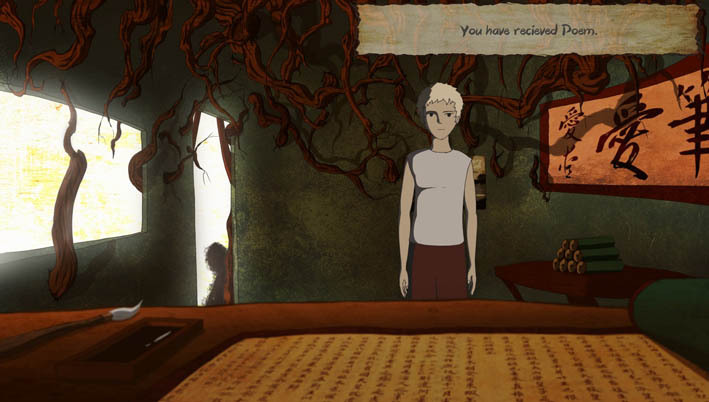 The few cut scenes found after solving each major puzzle are short and direct. The animations do more than show what the character is experiencing: they evoke a poignant emotions – sharp sensory impulses of lust, fear, peace, harmony, longing, or disgust. The experience is palpable and moving. You play as Yanagi, a young villager who is preparing for a life-changing ceremony with his village. There is neither urgency to the game nor is there a driving pressure. The curtain draws on your character lazily waking up in his room, and you are allowed to explore the surroundings at leisure. It’s a pace which persists throughout the adventure. The mechanics are simple, like the minimalism of the art direction. Scrolling up will access your inventory, and the click-and-drag function allows for interaction with your items. There is no run function, and your character walks at a casual pace that straddles the line between unbearably slow and calculated enough to fully take in the scene. The puzzles are straightforward and logical. Saucer-Like incorporates the plot and progression into the clues and solutions, so the puzzles you solve tell part of the story. For all its beautiful wonder, though, Saucer-Like is SHORT! I mean surprisingly short. It’s slow paced, and I loved taking my time delving into the rich details of the world, yet I still completed it in under one and a half hours. I'm accustomed to the short form titles available these days, but this isn't even a full episode. It plays as if Kubo and the Two Strings were a short film. There’s nothing wrong with short form, but I worry about potential abuse of Steam's two-hours-or-less return policy. Saucer-Like could benefit from being packaged with other, lengthier titles. I wonder, had Portal been released as an individual title, would we still be saying the cake is a lie? Unfortunately, I experienced a black screen consistently after a period and despite how short this game is, it glitched on me at least once per playthrough. The current version has language support for English, German, Russian, French, and Spanish. The dialogue in the game is easy to follow, and the options never get confusing or convoluted. However, a few of the English translations have some odd wording or misplaced grammar, but not enough to be jarring or lose the ambiance. If you are the type of player who only loves the puzzles and skips the dialogue and cutscenes, this is not the game for you. If you enjoy the short form medium and all its nuances and subtext, you will appreciate Saucer-Like. Part of the appeal of traditional point-and-click games is the long, arduous journey you take with the character, building a strong tie over many hours. I think that what Garnelo has done is even more impressive, given how short it is. 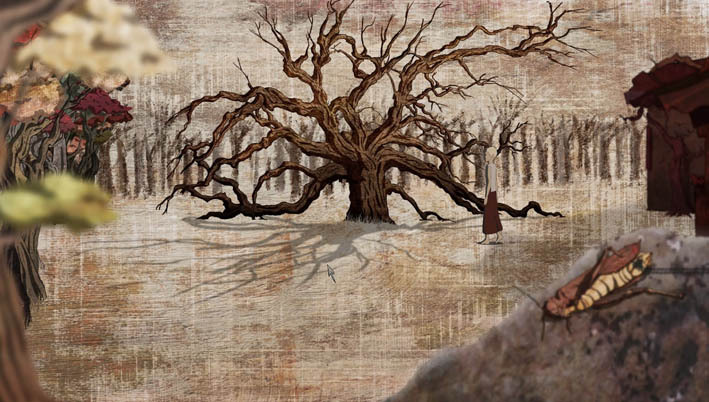 The complex issues of personal identity and self-awareness are deftly handled through the imagery and gameplay. The poignant emotions it can pull out of you will remain with you long after you have finished the title.